Characteristics : sharp and durable; Super anti rust; Light energy. Craft : 67 layers Damascus steel optical lens processing forging process.. Handle is made of Colour wood which is durable, non-slip, easy to clean, waterproof, bacteria-resist, comfortable, and beautiful. Damascus pattern to improve stain resistance and to prevent food from sticking to knife body. The tapered grinding of the blade is allowed to achieve an Extremely sharpness. The handle of the knife is provides the max control on movements with minimum efforts. Durability and good balance,combined with resistance to corrosion and elegant Damascus pattern making a knife worthy hands of professionals. Super anti rust. Dishwasher safe. 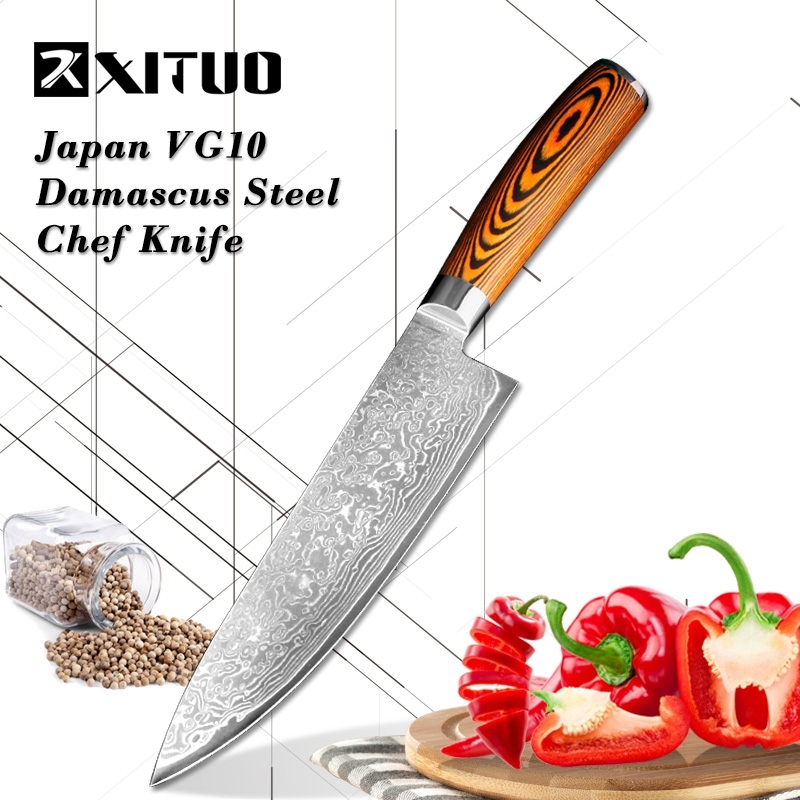 Material : Japanese 67 layers Damascus steel and VG10 steel. Handle: exquisite Colour wood handle, Use for a long time not to distort, not faded, not shrinking, tasteless environmental protection . characteristics: sharp and durable; Healthy environmental protection; Light energy, it is best to the chef! characteristics : sharp and durable; Healthy environmental protection; Light energy, it is best to the chef! Material : Japanese 76 layers Damascus steel and VG10 steel. Handle: exquisite wood handle, Use for a long time not to distort, not faded, not shrinking, tasteless environmental protection . Craft : 76 layers Damascus steel optical lens processing forging process. Sharpness level : the level of cutting force: 6.0-8.0 N international standards.